If you are experiencing technical issues whilst using www.catchoftheday.co.nz such as buttons missing or drop-down menus not appearing, this is most likely due to your Internet Browser not being compatible with our website. This can be easily fixed by upgrading or switching to the latest version of Google Chrome. We are committed to improving the Catch NZ experience for our members, so we would greatly appreciate your time to provide this invaluable insight for our team if you have been experiencing technical issues. 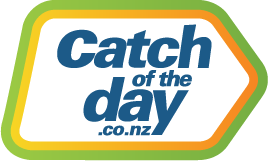 Are you using a PC, iPhone/iPad or Android device to access www.catchoftheday.co.nz?